A stupefying concert last night at Cité des Arts – South Corean musician Hyo Young Kim played traditional and contemporary songs on a Saeng Hwang, a “mouth organ” with vertical pipes played by the mouth and fingers. Pianist Julien Eckenfelder played beautifully too and even helped me decipher the music with his alert movements. 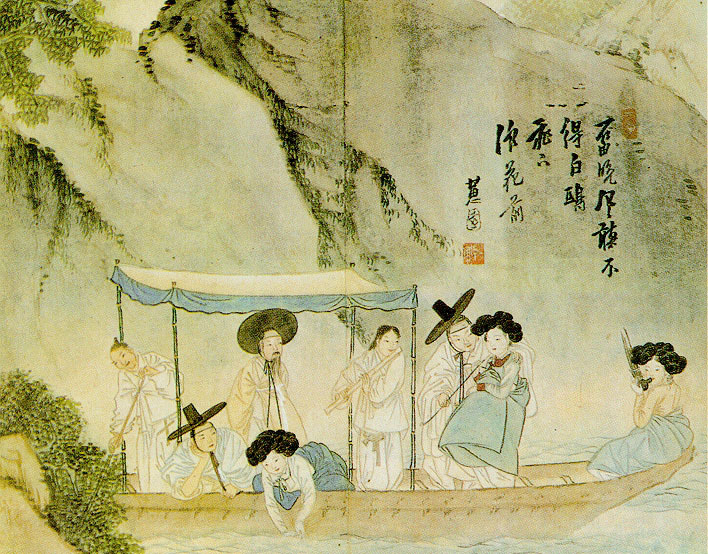 Image: A gisaeng playing a saenghwang (far right). The painting is from the Hyewon pungsokdo (1805). The painting Ju Yu Cheong Gang (주유청강, 舟遊淸江), early 19th century, by Hyewon. Original stored at the Gansong Art Museum, Seoul.